The city of Trat is the start point for most travellers heading to their island in tropical paradise (for information on how to transport a dog to Trat click here). All guesthouses are able to book boat tickets, but tickets can also be booked from the offices located near the Trat Market. A ticket of 350 Baht includes taxi service from Trat to the pier, the ferry ride, and taxi service to your guesthouse/resort in Koh Kood. The two primary ferries to Koh Kood are the Ko Kut Express and Ko Kut Princess (Koh Kood and Ko Kut are the same name for the island). Songthaews (converted truck bed with bench seats) are the common form of taxi service in Thailand. Dogs are allowed on songthaews at the discretion of the driver and attitude of the other passengers. To date, Zala and I have not had an issue. The Ko Kut Express allows dogs with the exception of holidays and weekends during high season due to crowding. Have your guesthouse check in advance. 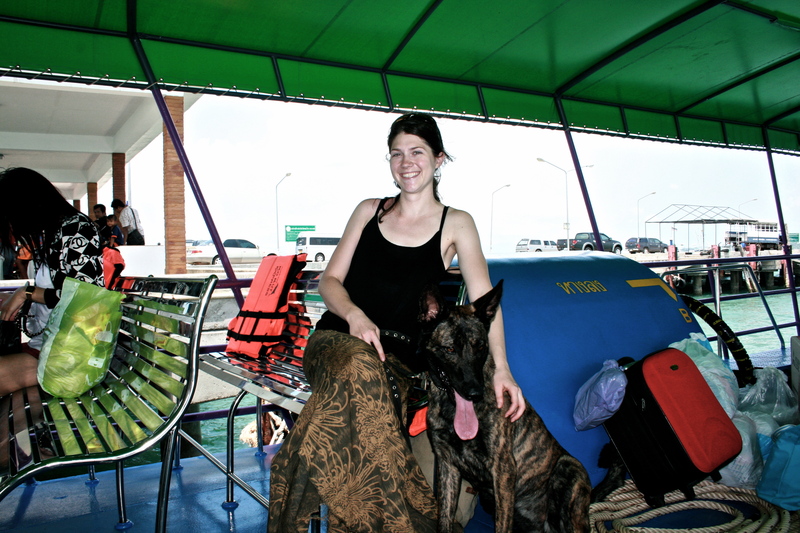 Zala rode free of charge.The trip from the main land to Koh Kood is an hour. Be prepared for photos and looks of fascination from fellow passengers. Songthaews will be waiting at the pier to take passengers to their guesthouses and resorts. The trucks get packed tightly with people so, as always, know your dog’s threshold before you put them in this situation. Many high end resorts such as Peter Pan Resort allow dogs. A few budget friendly guesthouses such as PD Guesthouse and Mata Guesthouse also allow dogs free of charge (no dogs allowed at Cozy Guesthouse). The island has a large population of stray dogs. They are an unavoidable part of island life. PD and Mata guesthouse in particular have a large pack of strays. 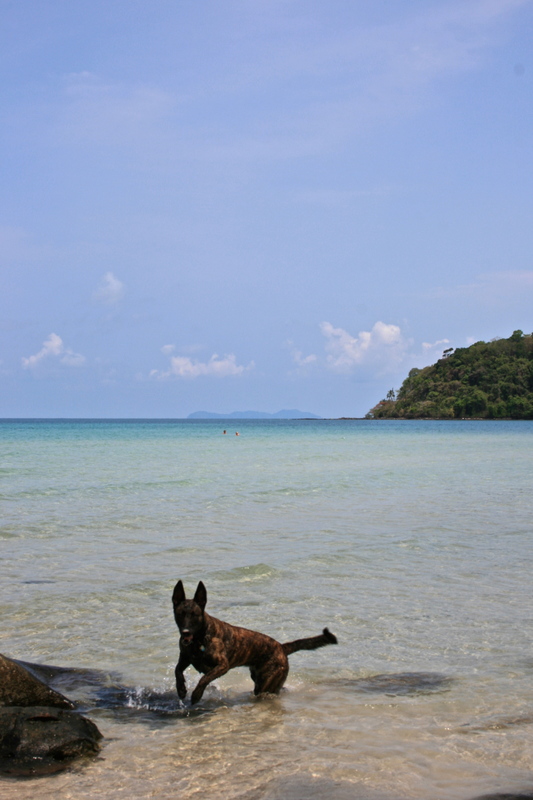 Please see my article on walking a dog in thailand for advice on handling stray dogs. Koh Kood is still relatively undeveloped and untouched. Be sure to bring enough cash for your entire trip. There are no ATMs on the island and only the big resorts accept credit cards. Dog restrictions do not exist. Your dog is free to explore the white sand beaches off leash with you and join you for meals. Enjoy your stay in tropical paradise!